I love running. I’ve run quite a few marathons, and a couple of ultramarathons. As a coach I help other people learn to love running and chase down their goals. I didn’t always love running. I was the one who skived off PE lessons, who came last in the 800 meters on sports day and who, after leaving school, avoided any form of exercise (other than drunk dancing in sweaty nightclubs) for the next 10 years. Approaching 30 I decided all this needed to change. I wanted to run. I wanted to be the person I saw on TV running down a beach carefree. It looked so easy. I could do that, right? A trip to the gym made me think otherwise. Running was HARD. Everything hurt. Everything felt wrong. I managed just two minutes of running before I had to stop. But many miles down the line running stopped being something difficult and started being enjoyable. I started leading running groups in 2013 and since then I’ve helped hundreds of women start or return to running. I run because of how it makes me feel: alive, relaxed and happy. Running has shown me I can do more than I ever thought possible and I want to share that feeling with others. I now help other people learn to love running and achieve their running goals. Whatever your reasons for wanting to run – whether it’s to lose weight, get fitter or de-stress – learning to enjoy running is key. If you enjoy something you’re more likely to keep doing it. And we all need more things in our lives that we enjoy and that make us feel good. 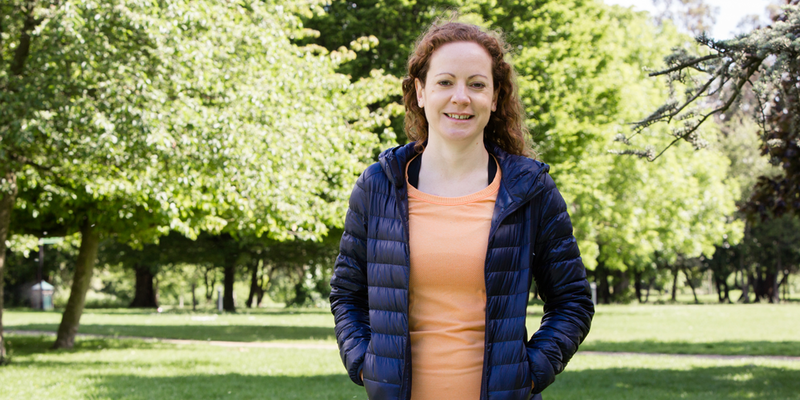 Laura Fountain is a UK Athletics Coach in Running Fitness and Level 3 Personal Trainer. She’s also a freelance journalist and editor specialising in women’s health. She has written two books ‘The Lazy Runner’ (Pitch, 2012) and ‘Tricurious’ (Summersdale, 2015).